Multnomah County, where Portland is located, is the smallest in Oregon, measuring about 474 square miles. The name may be a corruption of an Indian word meaning "down river." The Restoration Churches in America have typically been launched in rural and small town areas and then moved to the city. 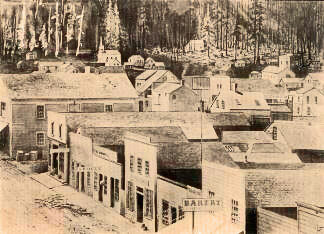 The development in Oregon was typical. Small town and rural churches in the Willamette Valley south of Portland became numerous in the years from 1850 to 1870. But there was no congregation in Multnomah County where the state's leading city is located. Link to an Oregon map showing Multnomah County. The original church in Portland was established in 1879 as the first outreach venture of the newly organized churches in the Willamette Valley. Among the founding personalities was William Harmon Adams, lawyer son of pioneer W. L. Adams of the old Blackhawk congregation in Yamhill County. In addition to Adams, the founding members included Olive S. Adams [pioneers of 1850], Edward Barton, Abigail S. Barton, Ambrose & Catherine B. Blaney , Dr. O.C. Blaney , Isaac G. Davidson, Helen W. Dickinson, John P. & Sally T. Dickinson [1870's], E. A. Downer, Joseph Warren & Ann Dennison Downer , Ella Fairleigh, Talbott Fairleigh, Mary Holman, Amanda A. Kellog, Clara Rinehart, Samuel Caleb & Elizabeth Ritchey , Maggie M. Robbins, Eliza Smith, William J. Wiggs, Lucy Yates and E.L. Yeargain. The first service was held in the rented Nonpariel Hall and the first purchase was a communion set. In the first month, the attendance grew from nine to 24. The first minister was Bruce Wolverton, employed to preach one Sunday each month during 1880. Mr. Wolverton was a graduate of Christian College at Monmouth and had studied under the men from Bethany on that faculty. When Wolverton was not a Portland, he was raising money among the churches to the south for the purchase of property for the church. He wrote an article in the Pacific Christian Messenger, published in Monmouth entitled Portland Lot Fund. It receipts churches and individuals that contributed. Allow me to receipt, through the Messenger, for subscriptions to the Portland Lot Fund. Buena Vista, $7.00; list receipted with H. Linville. Harrisburg, $19.50; list receipted with J. B. Harris. Konnewock, W. T., $10.00 individual subscription. Lebanon, Or., $10.00; individual subscription. Sodavilla, Or., $10.00; individual subscription. Several churches have sent in nearly the whole amount of their subscriptions, some lacking less than five dollars. We hope the agents appointed will take a little pains to collect the remainder, as interest is increasing the amount of our indebtedness, and the church is unable to make up any deficit. If any part of the subscriptions have been received let the agents send in immediately that payments may be made as fast as possible. An early record tells of a woman who came 50 miles to be baptized by Wolverton. This was before the days of paved roads and comfortable transportation. The baptistry was the Willamette River. Early pioneers recall river baptisms when ice had to be broken to reach the water. But then, Jesus' tomb was cold, too. The church reported in 1881 that John P. Dickinson and Ambrose Blaney were elders and W. L. Adams and Isaac G. Davidson were deacons. 1881 was significant for at least two other reasons. James A. Garfield, a Restoration preacher, became President of the United States and the new church in Portland built a small building (35' x 60') and numbered 57 people. A year later, they numbered 102. A remarkable part of this story is that first property was located on Portland's west edge at Columbia and Park. 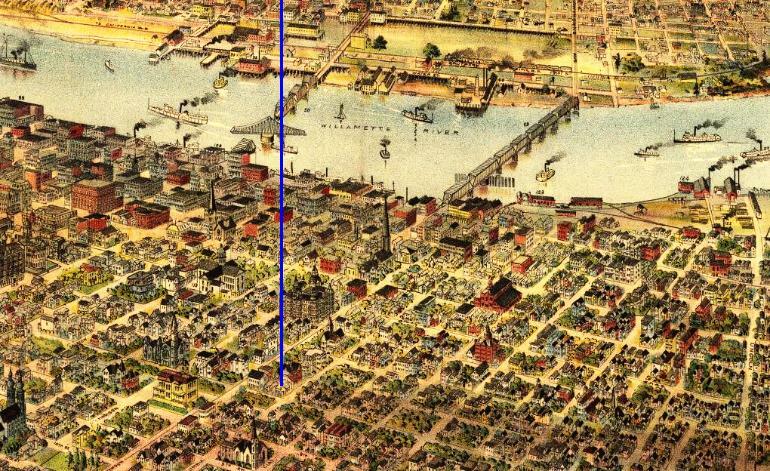 See the exact location of the building on a panorama of Portland. Portland, May 13. -- We are rapidly on the upgrade in this great city. Audiences measured by the size of our chapel. A new church edifice projected that will be a credit to our cause and and ornament to the city. Twenty-one added in the two months of my work here -- 4 by confession. Our Sunday school will soon be too large for our house, and it is the most liberal Sunday school I ever saw. Young People's Meeting just started which promised to be greatly useful. Prayer meeting enthusiastic. The brethren are full of hope. One year later Mr. Wetzell report 103 additions since he had arrived. 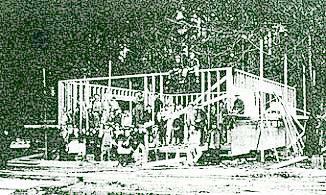 It became necessary to construct a tabernacle at East Park and Columbia Streets to handle the surging crowds. Today, the church still meets at its original location, even though Portland has grown from a village of 17,000 souls to a metropolis of one-half million. The congregation has continued to expand its facilities and today covers one city block. Their offices are located in the ornate, century-old Ladd Carriage House, which is on the National Register of Historic Places. The church has remembered their past with Historical Windows honoring: Thomas Campbell, Alexander Campbell, Barton Stone, Isaac Errett, J. W. McGarvey, Archibald McLean, James A. Garfield and Albert Shelton. A group of Armenians living in Portland were a significant portion of the membership at one time. Even a separate congregation was launched among this group briefly. Working with the Armenians were Mr. and Mrs. G. N. Shishmanian who left Portland for Constantinople, Turkey to preach the gospel among their people. G.N. Shishmanian was a native of Armenia, born near the headwaters of the Euphrates River. He had been a resident of Constantinople before moving to the United States. He was baptized into Christ while living in Dallas and then moved to Lexington, Kentucky where he studied under J. W. McGarvey. Bro. Shishmanian spend some time with me last summer and delivered his lecture in our church, and I was very favorably impressed toward him. He struck me as humble, earnest, pious, and intellectual -- admirably suited to such a mission as the one proposed. Mr. Shishmanian was imprisoned in Turkey in September of 1892 for his leadership in Christian work. He was later released. When David Wetzell was leading the Christian Church in 1889, he submitted a remarkable report to the Christian Standard. Portland, April 18. I have made a discovery. I have found a church and preacher in the city of Portland set for the primitive faith. Yesterday the minister of a Swedish church came to the parsonage accompanied by an interpreter to inquire why we called ourselves Disciples of Christ or Christians. We had not talked ten minutes until I discovered that I was taking to a most intelligent man, who was led into the truth by Dr. Holck, our missionary in the Scandinavian peninsula, and Bro. Devold, a worthy colaborer of his. This Bro. Erikson has been preaching to his countrymen in this city for about a year, during which time he has taken the confession of some 20, and now has a congregation of something more than that number. They meet in a nice room which will seat probably a hundred; seated, carpeted and well lighted. In company with Bro. Hystrom, who preaches for our people on the East Side, I went to their hall to their meeting last night, and Bro. Hystrom spoke a few words to them in their own tongue, and I made a short talk in English, and a more joyous little gathering I never saw. They did not know that the American people had a church of like faith in Portland. I heard Bro. Erickson preach last night and while I could understand but little he said, I do not hesitate to pronounce him a fine preacher and a magnificent man. But they must have help in order to continue their work. There are nearly 4,000 Scandinavians in this city and Bro. Erickson is the man to work among them. The larger percent of them are poor people, but a more intelligent and upright class of people cannot be found. I have promised to preach at their hall next Wednesday evening as most of them can understand the English language. Bro. Hystrom will soon hold them a two or three weeks meeting, as he speaks the Swedish language fluently, and I will join in the effort as far as I can use my English. A Swedish historical source says the group was established in 1887 and built in 1912 at the corner of NW Glisan and 17th Avenue. The building pictured is on the National Register of Historic Places and shows that it was built in 1912. However, the Sanborn fire map of 1908 shows the Swedish Mission Church building already on the southeast corner of the intersection. It appears to be the building photographed above by Bill Manlove in 1981. 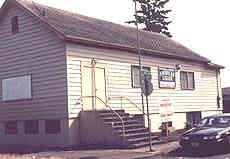 The Swedish Mission Church was incorporated with the State of Oregon on December 31st, 1890 by O.J. Lawrence, Edward Franseen, J.A. Backstrand, Alfred Alm and Axel Hendrickson. This is almost certainly the group reported in the Christian Standard of 1889. Leaders at First Christian Church were outreach minded. Under the leadership of David Wetzell in 1891, a mission was established among the Chinese immigrants in Portland. There were 50 members to begin with. The next year Jeu Hawk, a graduate of Drake University, came to lead that work. In 1900 he returned to China and Louie and Grace Hugh came to lead the church and remained until 1909. Their children remained with the congregation until it closed in 1924. While there are variations in the records, historian Swander (in his supplement) remembers that Jeu Hawk and Louie Hugh were sent to China by First Christian Church. Lee Tong, a graduate of Eugene Bible University, took leadership of the work until 1915. 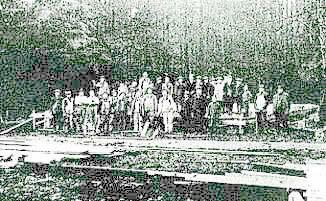 Many Chinese laborers had come to America to build the railroads such as the line through Amity and Monmouth. With the change in immigration policy toward oriental people, the work and the Chinese population declined and was eventually closed. Pictured at the right is John Fletcher Ghormley, vigorous and energetic minister at First Christian beginning in 1897. When he left to establish new churches in 1903, the congregation had reached the level of 600 members. After leaving 1st Christian, J. F. Ghormley moved across the Willamette River to work with the Eastside Christian Church, the Kern Park Christian Church and the Montavilla Church. Mr. Ghormley was a graduate of Eureka College in Illinois. Prior to moving to the Northwest, he had worked as State Evangelist in California. Mr. Ghormley conveyed his passion for preaching to his family, because two of his sons became ordained Christian ministers. See the entry below for the Montavilla Church. First Christian Church remains affiliated with the Disciples. Historian C. F. Swander records a congregation reporting from Sycamore, on the south side of Powell Butte on Foster Road. This was 1891. The census shows this was a farming community. Nelson A. Flinn from West Virginia was the postmaster. The name Sycamore was used less after the Post office was closed in 1901. The group appears to be the same church that was also known as Pleasant Valley and may have met in that school house. Sycamore residents would have had access to the downtown First Christian Church, but the trip was long and it was not easy to take the neighbors to church. It made sense to meet right in the village. The congregation is listed in the Disciples of Christ Year book for 1892 with 10 members. N.A. Flynn (the postmaster) is the contact person. Under the heading of "pupils and teachers," 35 are shown, so their outreach was larger than the membership total indicates. This congregation was first established by David Wetzel in 1893 as Third Christian Church. The name was soon changed to the Rodney Avenue Christian Church. It met at the SE corner of NE Knott and NE Rodney Avenue. This is one block west of present Highway 99, near Emanuel Hospital. The building had a 55' bell tower. The congregation was most certainly started by members of First Christian Church who did not want to make the long trip by carriage to down-town Portland. The preacher (or former preacher) from First Christian was the founding minister. By 1899, A. D. Skaggs was the minister. There is a profile of A. D. Skaggs. The congregation later merged with the Woodlawn Christian Church. The Woodlawn Christian Church built further north and east of the Rodney Avenue Church. Records show they began in 1895 and a 1909 map shows their building just east of the intersection of E. 6th on the north side of Liberty. The building sported a gymnasium larger than the church meeting area, a unique feature in that era. Rodney Avenue merged with Woodlawn and built half way between, forming the Mallory Avenue Christian Church. Kern Park Christian Church is the outgrowth of a small Sunday School. 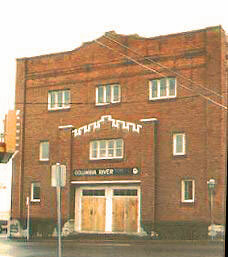 The first service was held in 1905 over a store building at 67th and Foster Road. This was on the wagon trail leading from Philip Foster's home in Eagle Creek to Portland where his sister lived. There were nine students and three teachers in that original Sunday School. The offering was fifteen cents. The work grew until the building pictured was built in 1907 at 69th and Pardee. J.F. Ghormley was minister at the time. The church has grown steadily over the years and now occupies a significant part of its block with added parking on another block. The church has kept better-than-average records and a researcher can contact the office (503-774-8819) for a detailed story of the growth of this congregation. For many years Kern Park Christian was a Disciples congregation, but in 1970, the congregation voted overwhelmingly to become Independent. To read the story of Kern Park Christian is to read a history of benevolent and mission work, of church growth and personal victories. 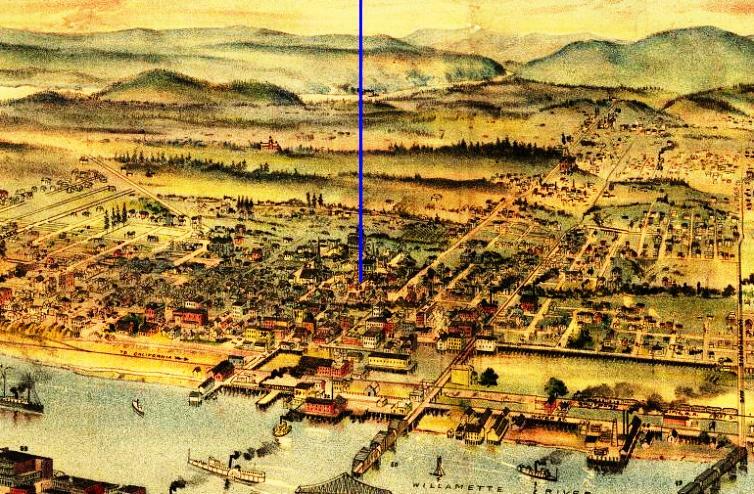 In its earliest days, Portland was on the west side of the Willamette River. (For those not acquainted, the river divides present Portland as it flows from the south to eventually merge with the Columbia River.) First Christian Church was on the west side of the river - where the people were. It seemed logical for disciples on the east side of the river to begin their own services. The man launching the work on the east side of the river was "Bro. Hystrom," a gentleman of Swedish heritage. He is recorded as working there in the Christian Standard of 1889. That same summer, the work was taken by Bethany-educated R. M. Messick. The actual location of the Christian Church on the east side of the river has been learned from a panorama located in the Library of Congress. A portion of that view in on this local link. The congregation was incorporated with the State of Oregon on November 20, 1890 by James Simpson, J.A. Monroe and F.J. Watkins. L. C. Haulman was preaching for the congregation, followed by J. F. Stewart in 1892. About this time, it began to be called Central in some reports. This church met in a storefront at what is now 34th and Main about 1904. J. Fletcher Ghormley (pictured above) was the minister for seven years. It was named East Side Christian Church. In 1909 the congregation built a temporary building at 19th and Salmon while a permanent building was being constructed at 20th and Salmon. 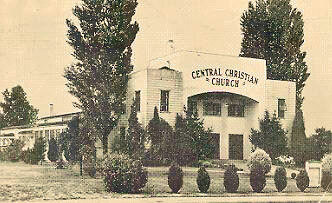 The building was completed and named Central Christian Church. Soon it became apparent the church could not afford the building and it was sold and is now Hinson Memorial Baptist Church. Later the congregation moved to 12th and Taylor where they remained until 1929. Their next move was to the building at 39th and Seneca (by Interstate 84). The group disbanded temporarily because of a major theft, but soon reappeared 180 strong at 25th and Madison. The year was 1932. It was called Christian Temple and O.D. Harris was the preacher. By 1952 the church was located at 27th and Hawthorne and the venerable Ralph Holcomb was the minister. We have a 2� postcard that Ralph wrote to a visitor that year and the church's photograph is on the back. Alger Fitch and Dallas Meserve are among the prominent church leaders that have emerged from Central Christian Church. Central is now located in a fine facility near 39th and Hawthorne. The Central building houses the Portland classes of Northwest College of the Bible, a four year preacher training school under the supervision of Central's elders. By 1900, the division over the use of instrumental music in the church assembly was well under way. 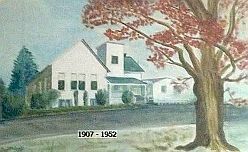 The first recorded congregation in Portland that began with the a capella preference is the old Lents congregation at 84th and Insley in the Lents district of S. E. Portland. The building still stands and is pictured here, though is has been used for many purposes since it housed the Church of Christ. That startup date was sometime before 1912. 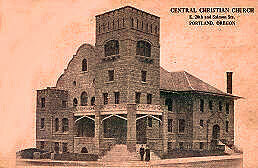 The congregation that emerged from these years is today's Central Church of Christ in Portland. The Montavilla name is a contraction of Mount Tabor Villa. The cumbersome name was quickly replaced by Montavilla by popular usage. The historic congregation in this section of northeast Portland has had several names over time. 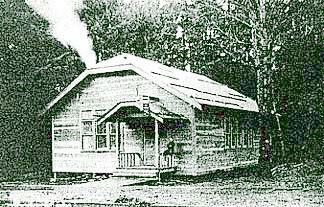 Beginning in 1910 the Montavilla Christian Tabernacle was "mothered" by the First Christian Church of Portland, with George K. Berry serving as founding minister. Mr. Berry had moved to Portland from Helena, Montana Territory in 1890. The new congregation met at first in the IOOF Hall at 80th and Glisan. By 1911, 60 names were on the church roll. In 1912 a basement building was built at 550 N.E. 76th Avenue and the church moved in. In 1914, J. Fletcher Ghormley opened his ministry at Montavilla and encouraged the church to complete their building. In the fall of 1915 work began and continued steadily until its completion in February of 1916. In the spring of 1915, Ghormley's son J. Carlos Ghormley replaced his father as minister and continued for a year or so until moving to the Rodney Avenue Christian Church in 1916. The front of the building was graced by four large, round columns which supported the balcony. Inside was a large auditorium with a platform that extended across the entire width of the building where for 33 years, beginning in 1935, hundreds of people could "Hear A. Word Preach The Word." The life of the controversial Archie Word is detailed in his biography Voice of Thunder, Heart of Tears written by Victor Knowles and published by College Press. Editor's note: Voice of Thunder has been digitized and is available on this site. Over time, the congregation has set national records for sending men and women into vocational Christian service. Prominent among the more than 100 people are Glen Ballard, Warren Bell, Don DeWelt, Dave DeWelt, Elston Knight, Burl Shoemake, and Francis Winder. This original building burned due to faulty electrical wiring and another building was built next door. That structure was sold and the church moved to a new building on 102nd Avenue. It eventually became the 600 member Crossroads Church. See their Web Site for more information. For additional information about the early history of the congregation, call the church office and ask to see Montavilla Memories, a well researched history by Ron Carlson. The church had met in Wall's Hall above Wall's Drug Store, and other places. The preacher at that time was Andrew J. Adams. Others preachers connected with these startup years included E. E. Jones and Thomas G. Pieton. When the church built a building, the preacher was J. A. Melton. This little church has had a colorful history. Much of its life it has spent in halls and storerooms. 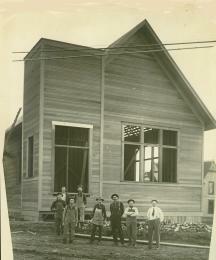 In 1912, with the aid of the City Mission Board, they erected a little home on East 17th and Nehalem Streets. Difficulties arose which caused the congregation to abandon the church house to the bats and they began to keep house again in a rented hall. About 1920 they purchased an abandoned church property at East 8th Street and Spokane Avenue. They improved the property and changed the corporate name of the church to Spokane Avenue Church of Christ. . . . The "difficulties" Dr. Swander refers to was the assessment to pave both 17th Avenue and Milwaukie Avenues. The church could not afford the paving assessment so the building was sold and the group returned to meeting in public halls. However, the little group pressed on in spite of their setback. In checking the fire maps of 1924, the Spokane Avenue Church of Christ mentioned by Swander was clearly visible at the northeast corner of SE Spokane Avenue and SE 9th Avenue. Our special thanks to Eileen Fitzsimons and Frank Purcell for research assistance on this entry. The Building Built in One Day. Note the forest where houses now stand. here because of their unique nature. Click for a larger version of the finished building. Two very small church groups came together in Northeast Portland on February 12, 1922 to plan a "workers bee." One group had been meeting in a second floor dance hall at 28th and Alberta and the other group, also meeting in the area, was called the Tabernacle Church. Correction: Our source for much of this entry said that Tibbs Maxey was present as a leader. We had included this data. However, this cannot be true based on his obituary in the Christian Standard of January 27, 2002. He would have been just 12 years of age when this congregation was launched. A 100' square lot at 35th and Killingsworth was donated by W.E. Lewis. This was two blocks beyond the city limits and out in the country. (The city limits are now miles to the east.) Word was spread that these brethren needed help with the construction project and help came. On February 22, 42 carpenters (including seven preachers) gathered to turn $500 worth of lumber into a 30' x 40' church building. The first service was held in it that evening! This was the first Protestant church building in N.E. Portland. The preachers included Harold Griffis, historian Clarence Swander, W.E. Lewis, and J.R. Johnson. Now, more than 75 years later, the congregation is meeting on the same parcel of ground. The forest is gone and the neighbors have moved in. Many members now come from the immediate neighborhood. The first building was replaced by a second and then a third. All of this was made possible by the sacrifice of saints long gone from this earth. William Ervin Lewis (1891-1970), from Brookfield, Missouri, was a printer by trade, working for Willamette Lithographing Co. in Portland. He served the church for its first 14 years, largely supporting himself through his printing business. He married Trudy Wagener, originally of LaGrande, when he was nearly 50 years of age. 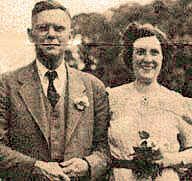 This may be a wedding photo. It appears that Mr. Lewis had been the preacher at the Corbett Christian Church in 1918. In his Master's Thesis for the University of Oregon, Victor Emanuel Hoven lists an "Erwin Lewis" as the preacher at Corbett. This is very likely the same man. At its inception, the congregation was called the Killingsworth Church of Christ. In 1924 the name of the church was officially changed to the Englewood Church of Christ to reflect the name of the Englewood district of NE Portland. In 1926 the name was again changed to the current Englewood Christian Church. The present facility was built in 1959 with an educational wing added in 1972. The congregation is Independent. If you have information that should be on this page, please contact us.